Ah, the great department stores of Paris. Rising up behind the glorious Opéra Garnier on the city’s right bank, with all their many floors of designer goods, luxury articles and gourmet foods. Galleries Lafayette, Printemps, these names have become so famous and they attract such an audience that they have their own Paris metro stops. They are in many ways (many costly ways) the pinnacle of shopping and are known in France as the Grands Magasins. 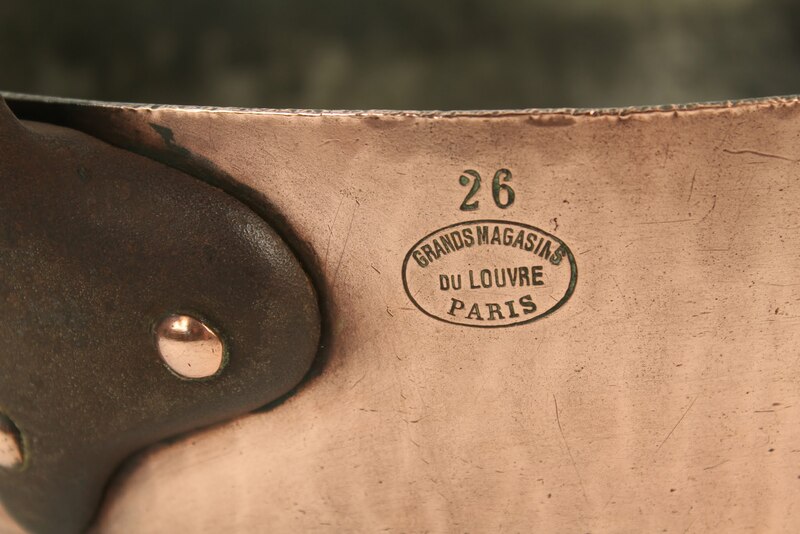 So, when on a recent cold and wet April morning we came across a beautiful hand-hammered sauté pan with the maker stamp of ‘Grands Magasins du Louvre‘ we were confused and a little intrigued. 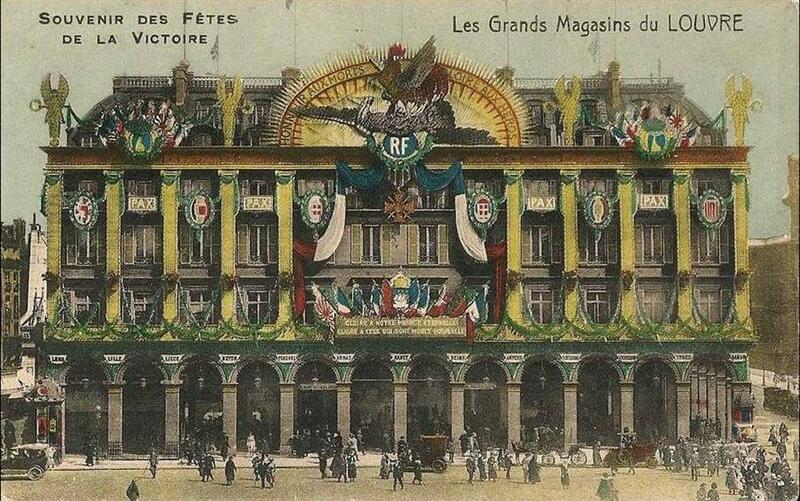 Was there another Grand Magasin we didn’t know about? Having been many times to the Louvre itself we had never come across any great department stores in that area, unless they were hiding somewhere, in which case how Grand could they be? The pan itself offered some clues. It was still in remarkably good shape, but based on the thickness of the copper and the manufacturing techniques used, it most likely dated from the first few decades of the previous century. 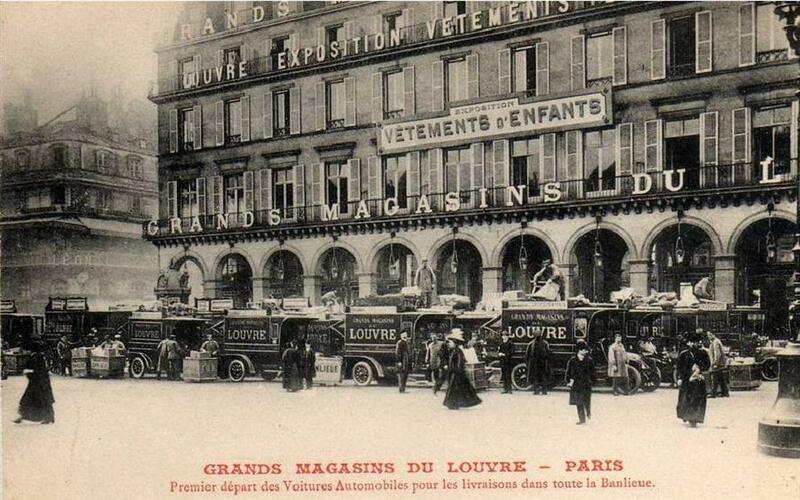 Perhaps there had once been a great deparment store close to the Louvre that now had disappeared? We started doing some research and as it turned out, we had stumbled upon a true bit of Parisian retail history, going back to the middle of the 19th century. Paris was about to undertake its major transformation from a still predominantly medieval street plan, to the large boulevards envisioned by the influential Baron Haussman. As part of the many changes, the Rue de Rivoli, which ran along the north side of the Louvre, was expanded and on a small square just across from what now is the main pedestrian path to the famous glass pyramid, a luxurious hotel was put up: Le Grand Hôtel du Louvre. Since the potential benefits of being in such a prime location wasn’t lost on the Parisian owners of the hotel, they decided to rent out the ground floor to a retail establishment. 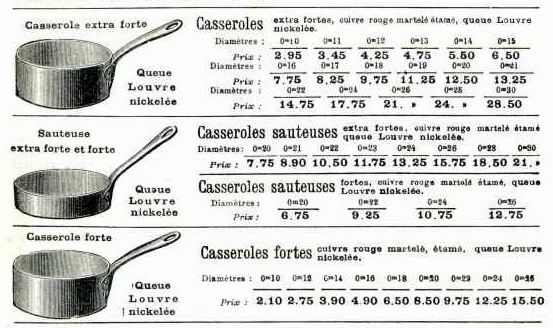 Catalogue image from 1911 showing a similar Sauteuse to the one we discovered. A trio of French enterpreneurs – Alfred Chauchard, Auguste Hériot and Léonce Faré – made the winning bid and opened Les Galeries du Louvre in 1855, a fashion house for the discerning Parisian consumer. At first business was quite slow, which led to the departure of Faré. It was a decision he would come to regret, because within a decade business had surged. Realizing that there was a demand for a general department store, the founders expanded on the original formula and would soon offer any product under the sun, from mink coats, to the costliest silk fabrics, from bathtubs, to indeed all types of kitchenware. Soon, the premises became too small. 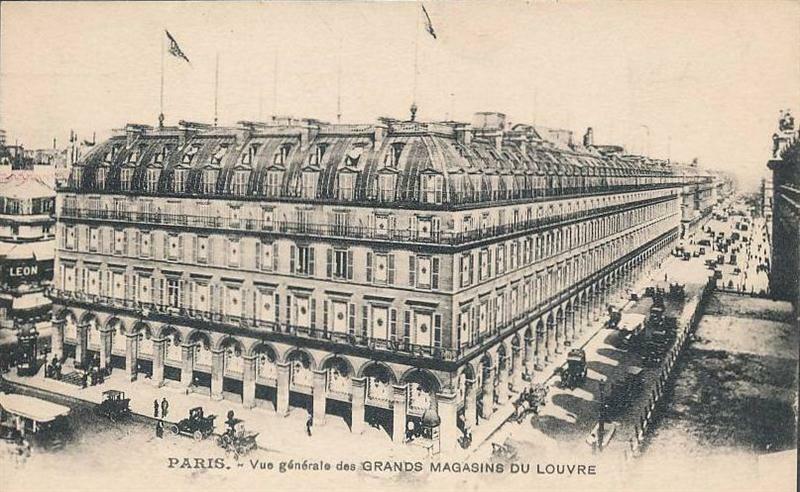 The hotel was moved to the other side of the square (where it can still be found today), the store was enlarged to take up the entire block and it was given a new name: the Grands Magasins du Louvre. By 1865 the company had revenues of 15 million francs, a very considerable amount in those days. Ten years later, revenue had almost tripled to 41 million francs. The store itself had become an institution. More than 2,400 employees staffed its 52 departments. It was the first great French store to open an affiliate across the Atlantic, and its annual events were highlights on the Paris social scene. At one end-of-year exhibition, it was said that 2 million toys were put on display in the great hall. The extravaganze of the surroundings, and the impact its retail innovations had on small neighborhood stores was among the inspirations for Emile Zola’s Au Bonheur de Dames. It was by any standard the greatest store in Paris, perhaps even the world. The block on the Rue de Rivoli that would be fully occupied by the new department store. The great silk hall where the finest materials from around the world were on display. One of the 52 departments that was staffed by 2,400 employees. Delivery trucks await their loads for the suburbs of Paris. For inner-city deliveries horse and carriage was used. The store continued its success through the first decades of the twentieth century, but during the Second World War disaster struck. On the night of the 24th of September 1943 an English Avro Lancaster bomber was brought down by German anti-aircraft guns. It crash-landed and exploded on the roof of the Grands Magasins du Louvre. The building was utterly destroyed in the fire, only pieces of the facade remained to guard the burnt-out interior. The store never recovered. In 1974 it officialy ceased business. A year later a British investor decided to renovate the building, and it now houses the 250 galleries that make up the Louvre des Antiquaires, though they only occupy the ground floor. Outside, on the pavement, next to the main entrance, you can still see two stone lions which belonged to the original building. The only reminder of what once was the greatest store in the world. 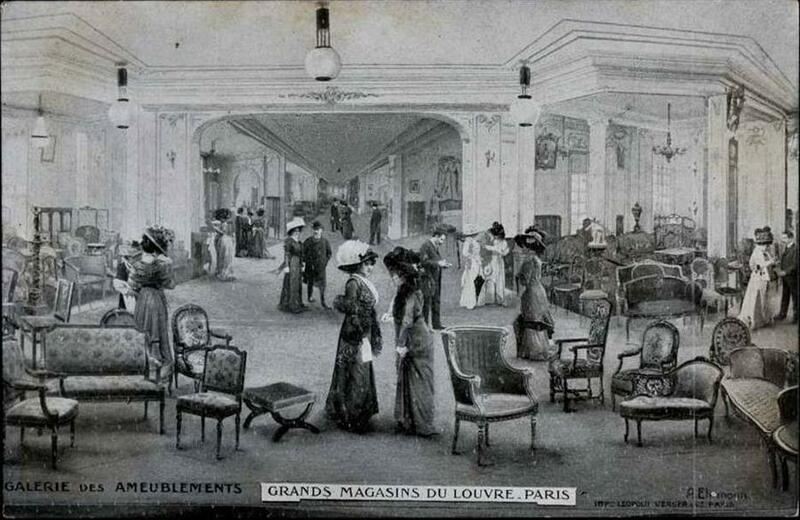 The Grands Magasins in their glory days. All postcard images are courtesy of Jean-Paul Devienne and many more can be found on his wonderful blog at commerces-immarcescibles.blogspot.fr. The blog was very helpful in learning about my copper cookware. My question is how to find the value of them? I recently purchased three Grands Magasins du Louvre pans: a 14, 16, and an 18. I’ve been trying to determine if these pans are, in fact, antiques. All of the information I can find about the Grands Magasins du Louvre department store seems to refer to the Wikipedia article. Unfortunately, that article is not written very well, and the history of Grands Magasins du Louvre is not clearly defined. If that information is correct, then any pans with the stamp “Grands Magasins du Louvre” would have only been sold between 1877 and 1889, which would certainly make them antiques. Have you been able to find out any more about Grands Magasins du Louvre since your original post? Thanks for leaving a comment. It’s indeed difficult to get detailed information on the history of these establishments. 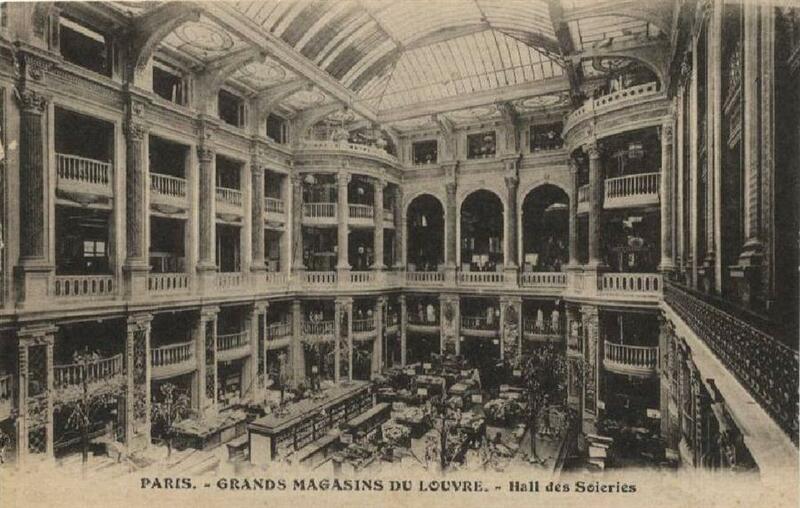 As far as we’ve been able to discover, the name Grands Magasins du Louvre was maintained until the destruction of the building in 1943. The plaque commemorating the loss of the Lancaster bomber lists the store name in that form, as do a catalogue from 1911 and several other pictures from the early 20th century. I have done a bit more digging around just now and was able to find an article from a newspaper called Le Petit Parisien, dated 25th September 1943, describing the incident and listing the building as Grands Magasins du Louvre. That would place your pans between 1877 and 1943. It’s in line with the pans we have discovered ourselves, of which the manufacturing technique is indicative of the early 20th century. I hope that’s helpful to you. Thanks for your reply, Peter! And thanks for the newspaper article, too! Based on the plaque and the newspaper article, we can be fairly certain that the store was doing business using the name Grands Magasins du Louvre in 1943, which indicates that the Wikipedia article is wrong about when it changed its name. If the Wikipedia article is at least correct about when the store went out of business, then 1974 is the last year the pans could have been sold. Like the pan you found, my pans, too, are thick, and appear to have been hammered in some way, which suggests that they are probably older than 1974. They’re certainly quality pans, so I have no complaints there! If you happen to find out any more about the store, I would be very pleased to know what you learn. I’ll check back here periodically. Maybe some of your other readers will post some more information, too. I am looking for French cookware. A friend found this item at a thrift store. It is very ornate and only two were made. It is very expensive it has a long wooden handle. It has the stamp Solomon on the cookware. I’m only interested in seeing of picture of the item. Beautiful read..if only we could travel back in time and visit the grand store!